The Beer Shoppe is part of the mini beer renaissance taking place in Ardmore, Pa., where I work, that includes Tired Hands and a soon-to-open Iron Hill Brewery. The Beer Shoppe is located in a strip mall near the Ardmore liquor store. As the name reflects, The Beer Shoppe is a bottle shop with an impressive array of between 800 and 1000 bottles of beer. You can find most anything and some rather unique beer ideas. I took home the Noble Rot from Dogfish Head, which is brewed with grape must, and DuClaw's Exile 4, a macchiato milk stout made with espresso verdi. The beer selection is reason enough to check out The Beer Shoppe, but the small bar located in the back of the store is another draw. The Draft Bar has two rotating taps that you can choose to drink at the bar or take home in a growler. Note: Mondays from 6:00 p.m. - 8:00 p.m. it has half price growlers! The back bar's Vienna hot dogs are the highlight, though. 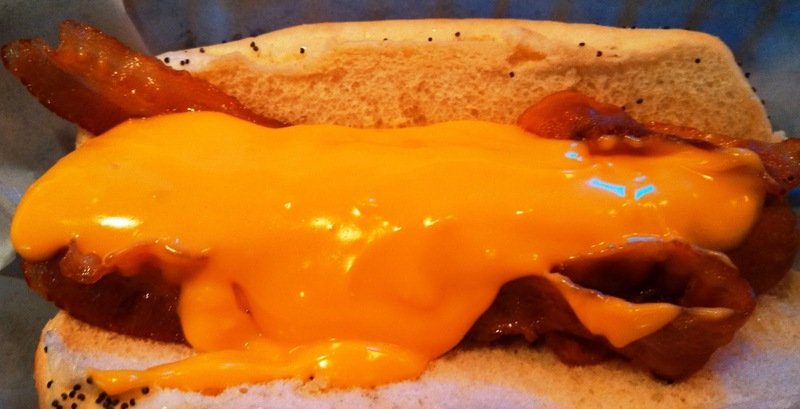 Vienna Beef dogs were used back in the Great Depression when the original Chicago Style dog with "salad" on top was born, so The Beer Shoppe menu includes Chicago Style as well as Chili, Kraut and Texas Hold 'Em hot dogs. Some dogs are a combination of the listed ingredients. I ordered the Chicago Style and the Texas Hold 'Em. 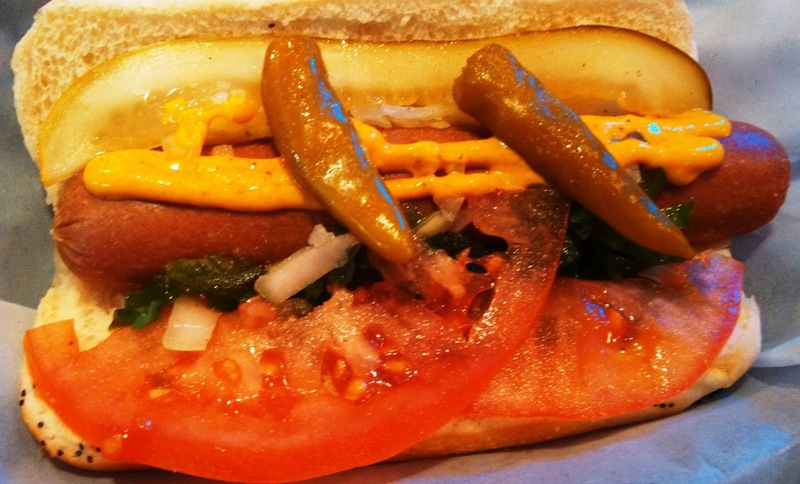 The Chicago dog comes with mustard, a pickle, onions, relish, tomatoes and a few hot peppers. This was easily my favorite of the two. At only $3.25 it’s a good deal, too. The Texas Hold em was less impressive. The dog is worth trying, but mine came with too much cheese whiz that overpowered the dog and the bacon. I'd rather pay double the price for the The Hot Diggity version. Overall, The Beer Shoppe is a nice addition for those of us looking for a quick lunch or some interesting beers in Ardmore.